Serious running is different now than it was in 2003, believe it or not. I’m just a wee bit older (just a wee bit! ), a little bit busier, and I have no beautiful Atlantic Ocean sunsets as rewards for my efforts. (All I’m seeing is fields of brown grass, y’all. Sing it with me — Ok-la-ho-ma, OK!) Oh, and this time around? I have my very own personal trainers. Don’t be fooled. 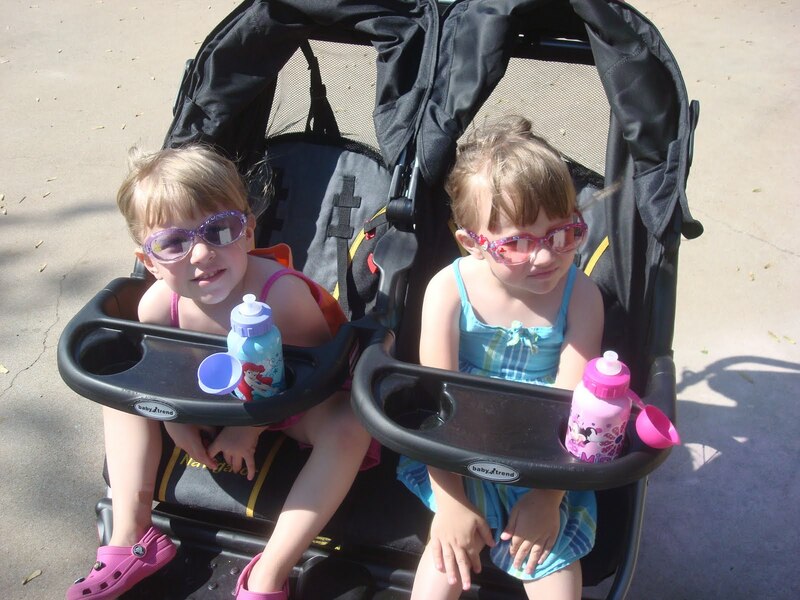 They look sweet, but right there in that stroller? Are two trainers that could give Jillian Michaels a run for her money. Granted, both of them together weigh about 65 pounds, and the stroller is probably only forty pounds, so pushing it isn’t all that difficult. What is difficult, however, is enduring the running commentary (pun intended) that comes with the company. Ana: I think I would like a BIG donut. Emma: I would like a LITTLE donut! HEY!!! There’s a puppy! Arf! Arf! Arf! Ana: Mommy, it’s hot out here! Emma: Yeah! And you are going too slow, Mommy! Ana: I don’t like this song. Can you change it? Emma: Look at that puppy, Ana! Arf! Arf! Ana: I think we should listen to the Mickey Mouse Club song. Emma: NO! The Snow White princess song! And then, it — arf, arf, arf! (laughing) Oh, that’s a SILLY puppy over there! Ana: Hey, I can’t get this water bottle open! Emma: I will help you, Ana…. I cannot get it open, either! Ana: HEY, MOMMY! (turning around in her seat and waving the bottle in my face) CAN YOU OPEN THIS?! Emma: I would like to go home now. MOMMY! CAN YOU HEAR ME?! Ana: Mommy, you sure are breathin’ loud. You can imagine, I’m sure, how helpful this is. Trying to do everything they need me to do while running and trying to keep up a conversation with them when they ask unnecessary questions? Well, it certainly makes for a harder workout. Despite the dialogue listed above that was indeed part of our last run, I was able to shave TWO MINUTES off of my time. How? It baffles the mind, y’all, but I think the girls actually HELP me run faster by getting my mind off the fact that I feel like I’m about to pass out. That's fantastic! How far do you guys go? My double stroller kicked the bucket. I have a bike trailer that I haul my preschoolers around in- may I ask how they are able to listen to music in their strollers?